Sale suffer a 12-try defeat in the Aviva Premiership. Wasps scrum-half Dan Robson scored four tries as his side beat Sale 50-35 in a superb 12-try opening fixture in the Aviva Premiership. The hosts had too much attacking flair for Sale, who were run ragged at times, but the visitors showed commendable spirit to compete and secure a bonus point. Christian Wade, Alex Rieder and Will Rowlands were the other Wasps try-scorers, with Jimmy Gopperth converting six and adding a penalty. Sale responded with tries from Byron McGuigan, Ben Curry, Denny Solomona, Faf De Klerk and Josh Strauss, with A.J. MacGinty converting all five. It took Wasps less than three minutes to open the scoring with a splendid try. Slick handling from their backs created an overlap for Wade, who raced away before passing inside for Robson to score. The hosts continued to look sharp in the ideal playing conditions which suited their style of play and it came as no surprise when they extended their lead. Well-timed passing sent Josh Bassett flying down the left flank and when the wing was hauled down by Solomona, the ball was recycled for an alert Robson to dart along the touchline to score. Minutes later Wasps had a third. Tom Cruse stole the ball in a maul for Danny Cipriani to run elusively and create a try for Wade, with a third conversion from Gopperth giving the home side a 21-0 lead at the end of the first quarter. Sale looked set for a long afternoon but they responded with an excellent try when, after good ball retention, McGuigan forced his way over with MacGinty firing over the touchline conversion. The respite was only temporary for the visitors and Wasps should have picked up their bonus-point try as Bassett failed to collect a pass from Nathan Hughes with the line at his mercy but a penalty from Gopperth still increased the hosts’ tally. Six minutes before half-time, Robson completed a first half hat-trick after Hughes and Ashley Johnson had combined cleverly to send him over. However, from the restart the scrum-half gifted Sale a try when his clearance was charged down for Curry to score, leaving the visitors 31-14 adrift at the interval. 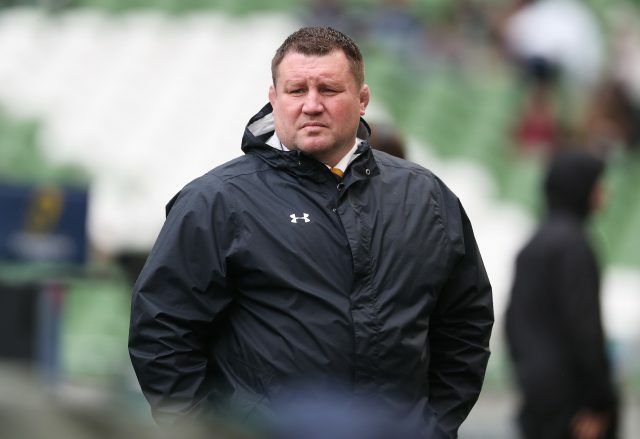 Within four minutes of the restart, Wasps looked to have sealed the game when slick handling from Willie Le Roux and Wade sent Robson in for his fourth before the scrum-half was replaced after 53 minutes. Cipriani also departed before Sale scored two tries in quick succession through Solomona and De Klerk but Wasps emphasized their superiority with tries from Rowlands and Rieder before Strauss scored the afternoon’s final try.